Product prices and availability are accurate as of 2019-04-15 23:29:03 EDT and are subject to change. Any price and availability information displayed on http://www.amazon.com/ at the time of purchase will apply to the purchase of this product. 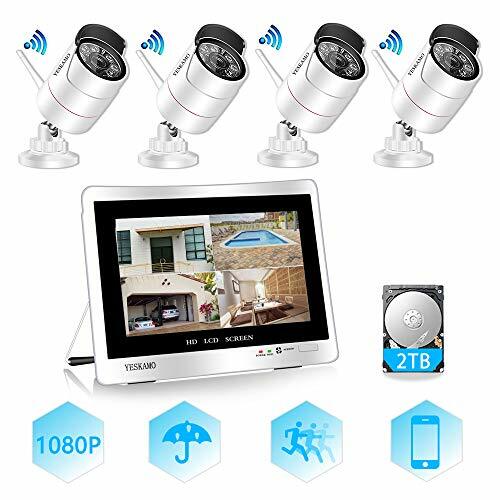 All in one Wireless Network Video Surveillance System: 12'' 1080P Monitor built in NVR recorder (not touch screen), save time and cost to select screen. 1080P HDMI port support to connect extra PC/TV monitor. cameras are auto-paired with NVR's WiFi network after plugging in the power adapter to an outlet, 24/7 live CCTV camera local working does no disturb to home router speed Just power on and all is done. No configuration! Except the power cable, no extra cable for the cameras is required Full HD 1080P (1920x1080) CCTV cameras with stunning detailed image. 4pcs 2MP wireless cameras let you see true sharp video streaming of your home and business. Much clearer and shaper, Wide angle than 720p ,960p cameras. 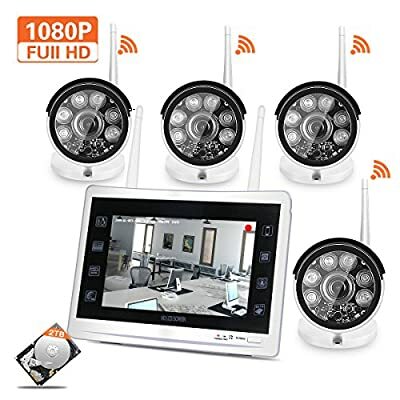 6pcs infrared LED lights ensure a long night vision distance in low lighting conditions up to 100ft in darkness, for 24-hour home outside monitoring and surveillance Wireless system works local recording and monitoring on screen even without any internet connection. 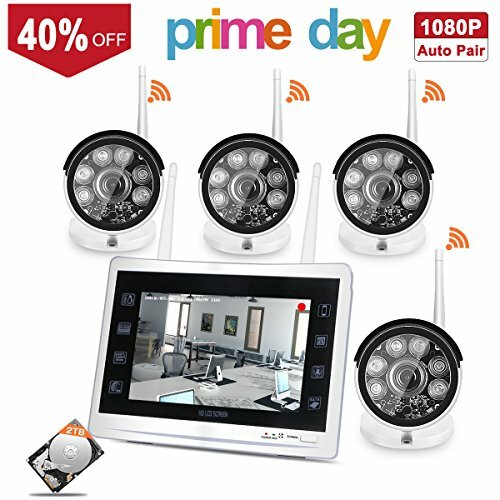 For remote view, wireless video security camera system is totally compatible for your mobile (Andriod and iOS System), tablet and PC (Client on Windows PCs & Mac computers) or visit IE browsers. Free APP can be download to remote view and playback recordings (Please make sure NVR is connected to your router by Ethernet cable) please mail us: yeskamservice@gmail.com for the software Outdoor security camera set for home supports playback, video backup and video detection. When under Internet condition, you can receive email alert or APP notification when movement detected. Customizable recording area and mode from 24/7 continuous recording, time-scheduled recording and motion detection recording. Video feed saved to 2TB pre-installed hard drive, camera footage will auto-overwrite when HDD gets full to leave space for newest footage. 2pcs USB ports for video backup and system YESKAM 1080P home security camera system wireless with advanced chipset and all power adapter certificated with CE, FCC and UL. 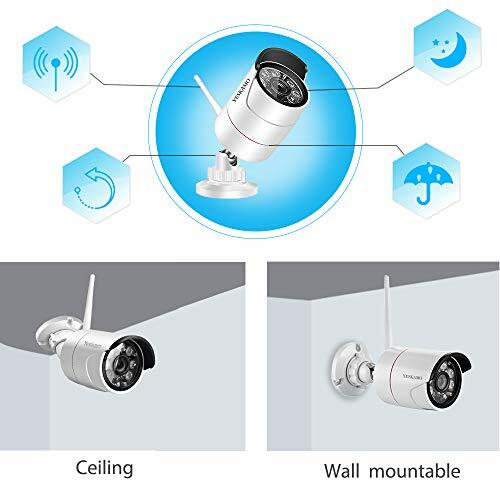 YESKAM CCTV system with 1-year free parts replacement, 3-year quality warranty and life-long free technique support service within 24 hours.Bullet metal cameras with adjustable bracket supports wall-mounting or ceiling for better viewing angle without uninstalling. IP66 metal waterproof housing works well under extreme weather condition -20?/-4? to 60?/140?